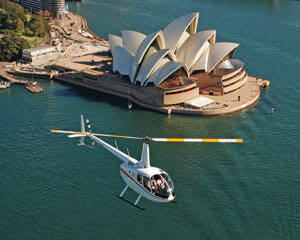 See Sydney's famous icons from the luxury of a 20 minute Scenic Helicopter Flight for two. Enjoy the sights of the Sydney Harbour Bridge and the Opera House, from a whole new perspective! Treat yourself and someone special with an incredible experience and the best views of the spectacular sights of Sydney with a private 20 Minute Scenic Helicopter Flight for Two. This helicopter scenic flight offers a truly awesome perspective on Sydney's Harbour and beaches, as well as the amazing views you will learn about this awesome city with a fascinating commentary from your pilot through your special noise cancelling headsets. See some of the world's most iconic landmarks from the luxury of a helicopter - the Sydney Opera House, the Sydney Harbour Bridge, Watson's Bay, Rose bay, Taronga Zoo, Manly Cove and Bondi Beach. Don't forget your camera to capture and keep these amazing views and memories. What about videos and photographs? Please bring your cameras. Photographic and video cameras are welcome to be used throughout all periods of flight. Our experienced pilots will ensure that all passengers have ample opportunity to capture that postcard image of icons such as the Sydney Opera House, Bondi Beach the most famous of all Australian beaches and of course the Harbour Bridge. When and where can I fly? Flights operate on demand, 7 days a week from Sydney Airport in Mascot. Was an amazing day, staff are friendly. The pilot was very friendly and made us feel safe. Scott was a great company during the flight we did over Sydney. Flight was great, easy to arrange and the staff were very willing to adapt. Sydney helicopters were professional, courteous and personal and the flight was fantastic. Highly recommended. We had a fantastic time on this flight. Would love to do it again.